Project obstacles and solutions: Lexington-Fayette Urban County Government was served with a consent decree by the U.S. Environmental Protection Agency (EPA) in 2011 to upgrade its wastewater treatment infrastructure. 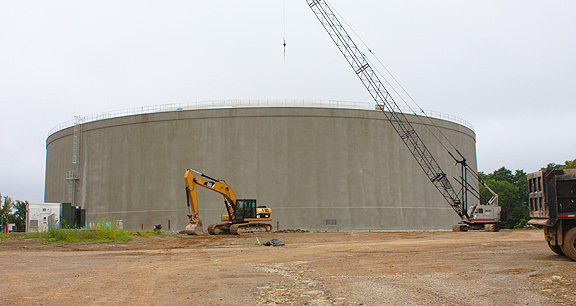 As part of that decree, a 22 million gallon wet weather storage tank was built at the Town Branch Wastewater Treatment Facility. A similar 6 million gallon tank was constructed at the Wolf Run Watershed. Both tanks are designed to take the burden off of sewer lines during times of heavy rain events. Prior to their construction, heavy rains caused combined sewage to spill into waterways in violation of the Clean Water Act. The EPA sued the city to stop these sewage spills and the city was fined. An agreement was signed following the EPAs legal action. Failure to comply with the consent decree would have resulted in more fines from the EPA. Judy Construction was chosen as the general contractor for these projects and Crom Corporation did all of the concrete work. The Town Branch project required 18,000 yards of concrete. The floor of the tank is 5' thick and called for 6,000 yards of concrete. There were four pours to complete the floor, each being a pour of 1,500 yards. IMI fed two pumps continuously for 12 hours during each of these pours. Trucks were spaced to deliver every 5 minutes during the floor pours. IMI supplied concrete from two plants: Lexington and Georgetown, Kentucky. IMI operational staff worked with Crom to make sure the concrete was arriving at the site and pumping correctly throughout each of these pours. The Wolf Run tank required 6,500 yards of concrete. Although smaller than the Town Branch tank, the concrete pouring requirements remained the same. After the foundation and walls were constructed, Crom applied shotcrete to the outside of the tanks. IMI supplied a mix that could be easily sprayed onto the walls. The Town Branch and Wolf Run tanks are on schedule to be operational by the end of 2016. For more information about pouring concrete used to hold water, contact the sales representative for the concrete plant nearest your location. Click here.